Whether a long-time resident of the Valley of the Sun, or a relative newcomer, you certainly have heard of Maryvale, an older community within the western boundaries of Phoenix. But you may not know the wonderful rags to riches story about the man, and woman, behind the early growth of the west side. John F. Long, a native Phoenician, returned home from his service with the Air Force after the end of WWII, and married his high school sweetheart, Mary Tolmachoff. Utilizing his ability to receive a G.I. Loan, he mustered up some tools and materials and began building their first home. Mary chipped in as well, making it a “two-man” home building project. About six months later, John and Mary had completed their new home at a total cost of $4,000. But just as they were about to nail in the last shingle on the roof, the couple was offered $8,400 to buy the house from them. With a chance to double their investment, they sold it, and started working on another home for themselves. This was the beginning of what turned out to be one of the largest and most successful home building operations in Phoenix history. In 1954, taking advantage of the wide open west side of Phoenix, (much of which was farm land), John devised an elaborate planned community he lovingly namedMaryvale, of course after his wife Mary. The plan included streets with rows and rows of homes, but also left aside space for schools, hospitals, churches, parks and even shopping centers. As it is said, “and the rest is history”. 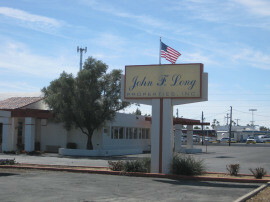 Maryvale became a huge success and led to the enormous John F. Long Homes, a home building company credited with constructing over 35,000 homes in the Phoenix area. He created a system not much different from Henry Ford’s assembly line process which allowed the home building company to construct 3 bedroom, 2 bath homes, with a pool, not only in less than 6 months, but could be sold for only $10,000. But John and Mary Long believed in giving back. They donated land which they owned for important civic purposes, including 60 acres of land for a new Milwaukee Brewers Spring training facilities, and was instrumental in bringing the Cardinals football stadium to the West Valley by donating the land that the University of Phoenix Stadium lies on today. The couple also donated money in support of health facilities and the growth of Southwest College. John passed away in 2008, but the name and face of John F. Long has been embedded in long-time Phoenicians as he and his wife Mary truly became some of the most important “movers and shakers” of the Valley, and certainly played a major role in the growth of the Phoenix area. His legacy lives on today with the John F. Long Foundation.